—–John Pearson Minor was born in Middlesex, New Jersey on 7 November 1791. He moved with his parents, Abia and Margaret Pearson Minor, to Greene County, Pennsylvania in 1796. The War of 1812 veteran remained in the Whitely Creek area for the duration of his life, serving as a financial lender, land speculator, cattle dealer, and farmer. He married Hannah McClelland about 1815, and had two children, Abia born 3 July 1816, and Robert born 11 April 1817. After her death in 28 April 1817, John married Isabella McClelland on 24 September 1817, and together they had 9 children: Hannah (6 June 1818-? ); Mary Ann (19 January 1820-? ); Margaret (5 November 1821- ? ); Rebecca (29 November 1823-5 July 1891); Samuel Pierson (23 August 1825–27 August 1909); Francis Marion (23 November 1828–4 August 1913); Sarah Ellen (10 September 1833–21 October 1862); Frances Caroline (9 May 1833–21 October 1862). Isabella died at home on 14 August 1863. John P. Minor left the family farm to his son Francis Marion on the condition that he be allowed to remain at the farm for the duration of his life–at no cost. 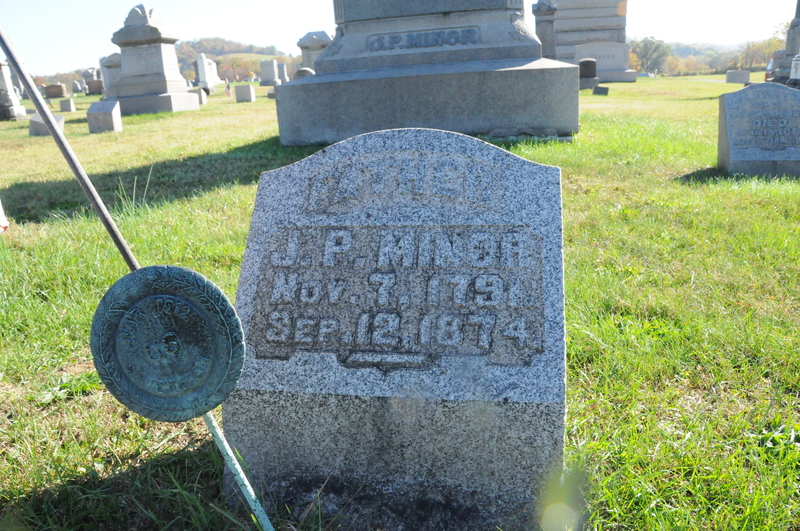 This Minor patriarch died at home on 12 September 1874 and was buried in the cemetery of John Corbley Baptist Church, Garard’s Fort, Pennsylvania.